11. Flower, John Wickham (1807-1873). “On a flint implement recently discovered at the base of some beds of drift-gravel and brick-earth at S. Acheul, near Amiens.” Quarterly Journal of the Geological Society of London, 1860, 16:190-192. Immediately after Prestwich gave his dramatic paper to the Royal Society in May of 1859, he returned to France, with other potential witnesses in tow, to look for more evidence. They visited Saint-Acheul along the Somme river, a site very near Amiens, where one of his companions, a geologist named John Flower, discovered this beautiful stone axe. It lay embedded 22 feet below ground level, and Flower removed it with his own hands. Flower announced his conversion to a belief in human antiquity in a paper to the Geological Society of London on June 22, 1859. 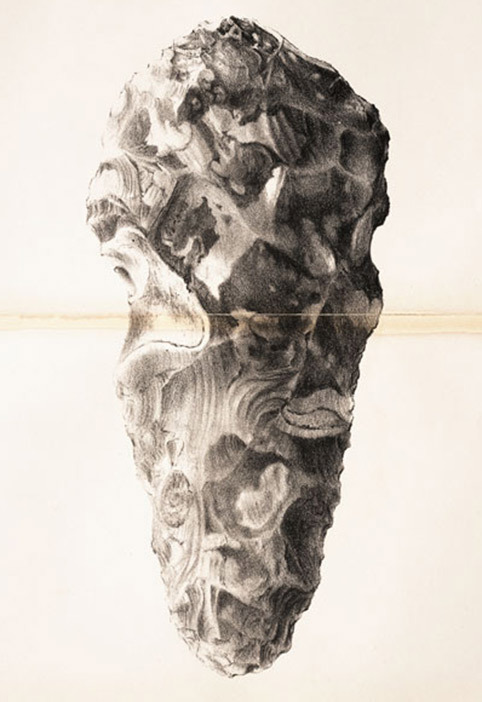 A lithograph of his hand axe, drawn by S. J. Mackie, was included in the publication. The location of the find, Saint-Acheul, will give its name to this kind of tool, now called an Acheulean hand axe.